After that, the Subaru WRX STI Type RA NRB Special will attempt a new speed record at the Nurburgring. This year’s Goodwood Festival of Speed promises to be an awe-inspiring automotive gathering featuring everything from pivotal race cars that defined motorsport, a tribute to Ferrari to celebrate 70 years of the prancing horse, and a selection of feisty Fords including the first UK showing of the Ford GT supercar. Also making its public debut at the show will be the Subaru WRX STI Type RA NRB Special, a race-spec version of the new special edition WRX STI. 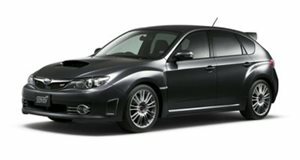 In case you’re wondering, RA stands for “Record Attempt,” which has been a long-standing tradition for Subaru performance models. It was first applied to a competition version of the Subaru Legacy back in 1989, which broke the FIA World Speed Endurance Record by clocking over 62,000 miles in 18 days and set a top speed record of 138 mph. Continuing the tradition, a race-prepared WRX STI Type RA NBR Special will be unleashed onto the Nurburgring this summer where it will attempt to set a new speed record at the Green Hell. Before then, rally and stunt driver Mark Higgins will be honing the special edition WRX STI around the famous Goodwood Hill Climb in the Time Attack Open class. If that name sounds familiar, that’s because it’s the same insane stunt driver who thought it would be a good idea to drive a Subaru down a bobsleigh run. He also set the fastest lap time in a car at the fearsome Isle of Man TT circuit. To help the special edition WRX STI shed some weight in preparation for its Nurburgring record attempt, the Type RA features a carbon fiber roof panel and rear wing, and the rims have been swapped out for a set of lightweight 19-inch BBS alloys. Under the hood lies a turbocharged 2.5-liter flat-four unit, while performance enhancements such as a cold air intake and high flow exhaust boost the power output to 310 hp.